What is Qingyan Ancient Town? Located 29 kilometers south of Guiyang City and originally built in 1378, Qingyang Ancient Town is acclaimed as one of the most charming ancient towns in China. Visitors to Guizhou are always amazed at ethnic minority villages, such as Zhaoxing Dong Minority Village - the largest settlement for Dong People around the world and Xijiang Qianhu Miao Village - the largest gathering place of Miao nationality in China. In addition, Guizhou offers other types of attractions to visitors to discover. With a history of more than 600 years, Qingyang Ancient Town is located on a hillside. The city walls were built with huge stones on the cliffs. There are four gates in the east, west, south and north. There are nearly one hundred cultural relics and scenic spots around the 3 square kilometers in the town, including 17 ancient temples, 2 memorial temples, 3 ancient stone memorial archways and other ancient buildings. The residences there features their own unique characteristic as well. The most famed buildings in the town are Zhuangyuan Mansion (状元府, the residence of the first Zhuangyuan of Guizhou in the ancient times), Wenchangge (文昌阁) where readers often read, gathered and worshiped the Wenchang Emperor in the ancient times, the well-preserved Ciyun Temple (慈云寺), Wanshou Palace (万寿宫), Longquan Temple (龙泉寺), Shoufo Temple (寿佛寺) and Temple Dedicated to Mr. Zhao (赵公专祠). Originally as a rest house for the businessmen in the ancient times, Wanshou Palace is a Taoist temple now. The most interesting building in the palace is the theatrical stage, of which the wood carvings are exquisite. On the wooden beams on the right side of the theater is a group of figure relief. In addition, visitors can explore several folk festivals in Qingyan Ancient Town, such as the dragon dance, and Tiaohuadeng Dance (跳花灯) during the lunar January, and Tiaochang Celebration of Miao people (playing Lusheng, singing and dancing) between the 9th and the 20th of the lunar January. There are also Avalokiteshvara temple fairs on the 19th of the lunar February and the 19th of the lunar September. 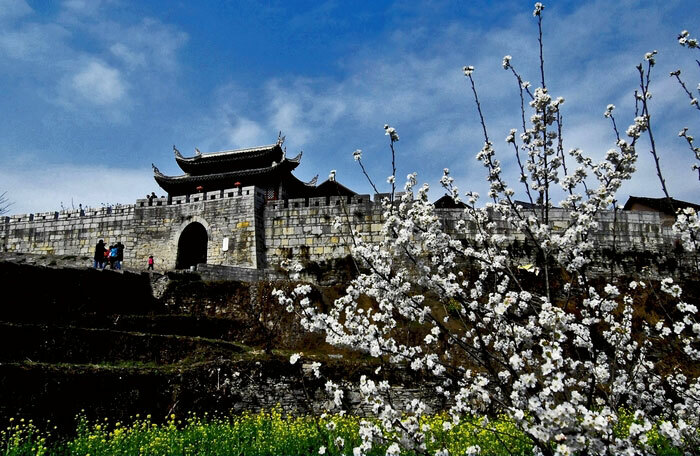 The best time to visit Qingyan Ancient Town is from March to October. If you are interested to experience the local culture more deeply, it is recommended that you visit the town during the time just mentioned above. As Qingyan Ancient Town is situated within Guiyang City outskirts, there are a few options. Fly to Guiyang first from other cities, such as Xi’an, Guangzhou, Chongqing, Chengdu and so on. Then, take the tourist shuttle from the airport to the West Gate Parking Lot of Qingyan Ancient Town. The first shuttle departs at 10:30 and the last shuttle, 19:00. Take a train to Guiyang first from other cities, such as Guilin, Wuhan, Hangzhou, Shanghai, Guangzhou, Chengdu, Beijing and so on. Then, take 203 Bus to the town. As at 25th June 2018, Entrance pricing only for the town is 10 CNY per person. The pass ticket for the admission to the town, Ciyun Temple, Zhuangyuan Mansion, Wenchangge, Wanshou Palce, Temple Dedicated to Mr. Zhao and Longquan Temple is 80 CNY per person. Opening hours for the town is 24 hours a day. Interested in visiting Qingyan Ancient Town on a Tour? Wendy Wei Tours offers a variety of different packaged tours as well as custom tours including Qingyan Ancient Town, among other attractions and destinations. To find out more, please visit our Tours page or Contact Us directly to find out more.